ecom's hazardous area tablet, the Tab-Ex 01, leverages Samsung's know-how and brings a new level of customer focused solutions and increased ease of use to mobile workers in Oil & Gas, Refining, Chemical, Pharmaceuticals and other hazardous industries. 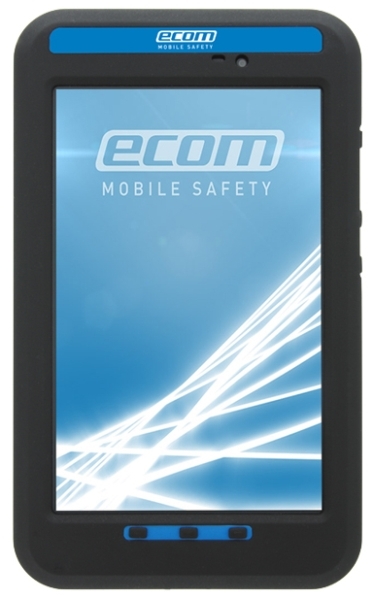 Recognising that many work tasks are performed in both nonhazardous and hazardous areas, ecom is offering an entire family of compatible tablets, peripherals and accessories suitable for worldwide use in Zone 1/21 & DIV 1, Zone 2 / DIV 2, and rugged environments. The Tab-Ex 01 is suitable for multiple mobile worker roles performing a range of tasks, such as Asset Surveys, Material Tracking, Operator Rounds, Inspection, Data collection and Plant Maintenance. The 8-inch screen enables the wide range of applications to become mobile in hazardous areas, allowing workers to view and interact with SCADA/DCS systems, enterprise systems (SAP, Maximo s.o. ), project management systems and computer aided design systems. Built-in cameras (optional) and a full range of wireless capability allows equipment defects to be captured during inspection and maintenance operations, and instantly visible to those who need to diagnose the issue and determine the follow-on actions. As private 4G / LTE wireless connectivity is increasingly adopted within hazardous areas, Tab-Ex 01 ensures access is fast and seamless - enabling users to quickly access the information needed to perform the task at hand. And, for sites with WiFi access or no wireless access, Tab-Ex 01 provides the flexibility to meet your needs - preventing costly infrastructure updates. Central to ecom's Mobile Worker concept, up-to-date Bluetooth standards are also supported by Tab-Ex 01, allowing real-time connectivity to both Bluetooth SmartReady Low Energy 4.0 (BLE) devices as well as older legacy Bluetooth devices. This allows the mobile worker to benefit from expanded Tab-Ex 01 capabilities such as data collection and measuring/ monitoring devices, headsets, AutoID, and Bluetooth Beacons for localization. Designed to deliver powerfully versatile performance and secure operations, the Tab-Ex 01 is a stylish, portable tablet device that is ready to go anywhere to get the job done. A portable tablet built for the enterprise world. Using an MDM system ecom customized configurations offers. However challenging the surroundings may be, the Tab-Ex 01 can always be counted on for professional, on-demand performance, featuring top-tier data security and seamless operations. Samsung KNOX Workspace provides robust, hardware and software integrated security for Samsung mobile devices. KNOX Workspace offers multi-layered protection from the device down to the kernel with two-factor biometric authentication for authorized device access. Plus, an enhanced KNOX framework and Microsoft Workplace Join provide users with a secure channel to corporate resources from mobile devices. The Tab-Ex 01 is a true mobile device built for performance and productivity on the go. The Tab-Ex 01 also features Samsung's exclusive Ultra Power Saving Mode, allowing it to run for days without shutting down. And with a wide range of connectivity options, business professionals working outside the office can stay connected with their clients and colleagues at all times. From HEXA-Band LTE* support for global travelers, to Wi-Fi and Bluetooth, it provides seamless connectivity.